This massive wave of destruction banded together a large number of commander under one goal – repair the stations and soften the blow Thargoids keep leaving behind them. Enter Operation IDA – a joint initiative welcoming commanders from all groups, factions and powers. Ever since the reparation of The Oracle station in Pleiades Sector IR-W D1-55 back in March 3304, Operation IDA members never stopped and managed to repair over 20 stations! What makes the whole initiative even better is their last attempt they call ''Zero to hero'' where they managed to repair a station in a single day. For those not aware – repairing stations left in destruction by the Thargoid attack is no easy feat! It requires a massive amount of resources hauled from various systems back to the station to make it operable once more. Take Gardner Hub for example, the station Operation IDA repaired last week, which took a whopping 285,000 commodities delivered, and they did it under 24 hours! Thousands of commanders gathering up in various forms of hauling and logistics vessels to try and push themselves to finally reach the set goal. At the moment, Operation IDA is moving to Werapana to take on the repairs at Bethke Ring and help the Hutton Truckers with their “10 in 10” station repair event where they aim to get ten stations up and running in ten days. 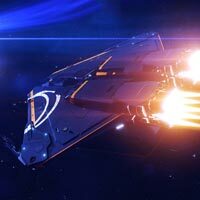 So, if you’re willing to lend your cargo hold and fight the Thargoids in a non-combat way, make sure to stop over at Operation IDA’s website where you can get more info on their endeavours. Thank you for the article. We're grateful for any publicity as Station repair as you mentioned, isn't so much about us, but is truly a community activity that is needed during war time. The more people who can join the cause the better chance we have of repairing our space infrastructure while the combat groups continue their heroic defense of humanity in all the systems currently being targeted by Thargoids. A couple of corrections however for clarifications sake. Gardner Hub wasn't repaired in a day. It was repaired in 36 hours. Operation Ida & allies however DID repair TWO stations in less then a day! Jett Market & Dyomin Station both in System HIP 23395 on April 6th 3305. 15 hours 15 Minutes for BOTH stations. 3 hours 36 minutes for Jett Market! Total haulage : 1,115,206 tons! Thanks again! Love your Page!